Old-fashioned hobby shops are seemingly an endangered species. But they’re not dead yet. Thanks to the popularity of the maker movement, hobby shops are enjoying a resurgence as kids (and grown-ups) look for fun, hands-on projects. Although you can buy most hobby supplies on-line, visiting a brick-and-mortar hobby shop can be an inspiring experience for children who like to tinker, experiment and create. Plus, they get a chance to meet their fellow enthusiasts and learn from the vets. This shop specializes in cameras and photo equipment. They also offer classes to teach newbie photographers, as well as more advanced shutterbugs how to use their camera and frame a better photo. They also offer classes on photo editing software like Lightroom. This shop is one of my family’s favorites. 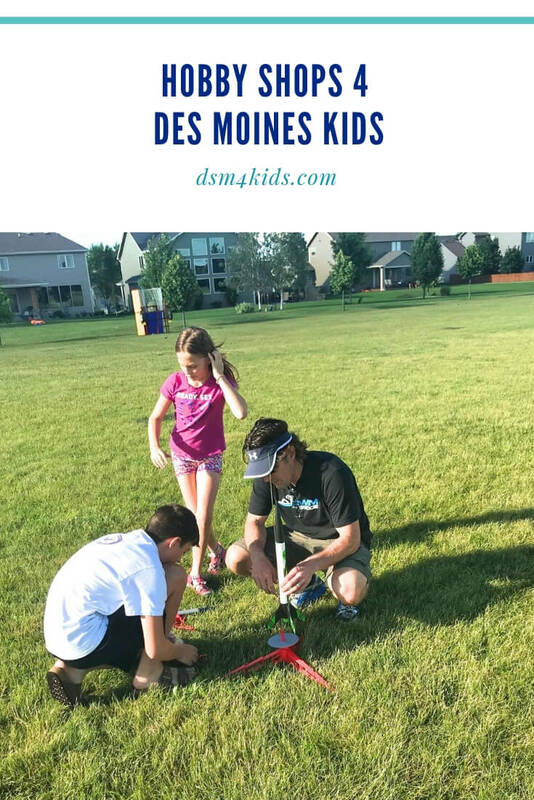 We got into launching rockets last summer and purchased several kits, engines and more here. We’ve also purchased drones and parts at Hobby Haven. It’s fun to browse the aisles and check out everything they offer. You’ll find model trains, remote controlled cars and planes, model building supplies and more. We never leave here empty-handed. This franchise, based in Lincoln, NE, is owned and operated by a local Ankeny family. Hobby enthusiasts will find a full line of radio-controlled hobbies like cars, drones and boats, scale models, games, toys, educational items, model railroad and more. This charming store in Ankeny carries stamps, scrap book paper, embellishments and more. In addition, they offer a wide variety of classes, crops, product demonstrations, and special activities. Be sure to visit their website calendar for a line-up of activities. This is a destination for train lovers. The store is filled with electric and model trains, tracks, layout accessories that can be operated indoors or outdoors year-round. Their expert staff will help you get started building your perfect model train collection. Need a place where you can work on your hobby? The Des Moines Makerspace is a non-profit community of makers, artists, and hobbyists. Their shared workspace offers the tools, technology, and resources you need to make your projects and hobbies a reality. Need help? Their informal classes, user groups, and shared expertise will help you develop the skills you need to finally start your dream project. Several membership levels are offered. Did we miss your favorite hobby store in Des Moines? Let us know!